First grader Symone Comrie gets a hug from a friendly Delaware County cop during the prayer service at St. Laurence Church. 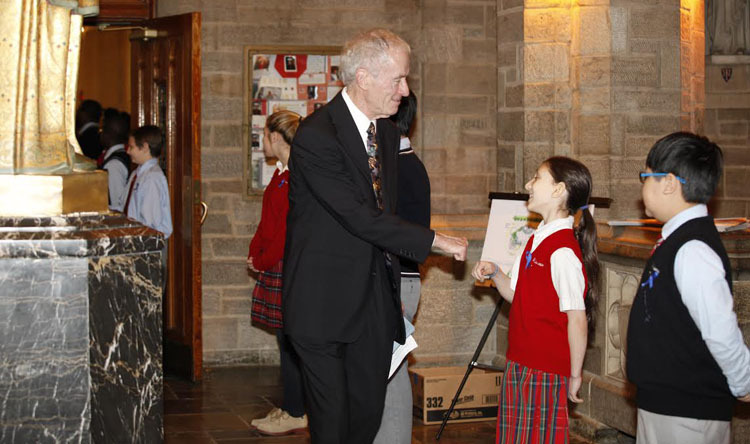 St. Laurence School in Upper Darby celebrated the recent Catholic Schools Week with events that focused on achievements in the classroom, in the church and in the wider community. 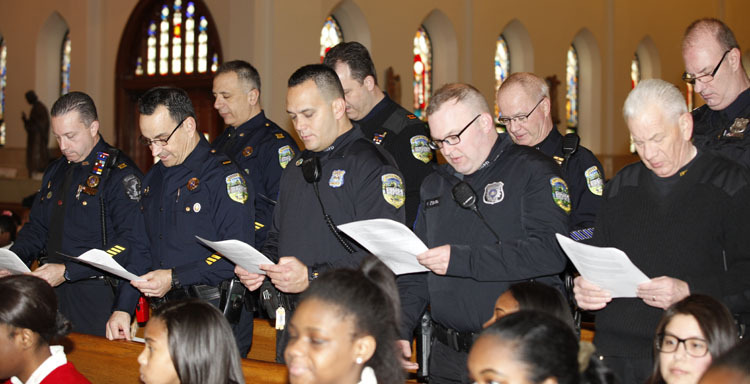 The school invited police officers from Delaware County to a prayer service at St. Laurence Church on Wednesday, Feb. 4, led by the parish pastor, Father Sean O’Neill. 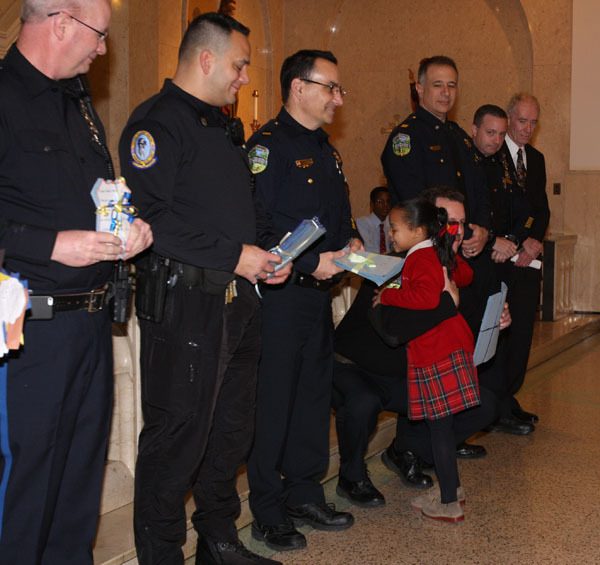 Students and other attendees prayed for the officers and presented them with small gifts of appreciation for their service to the communities in and around Upper Darby. Following the service and a reception for the officers, Father O’Neill and school administrators opened and blessed the newly renovated school library. 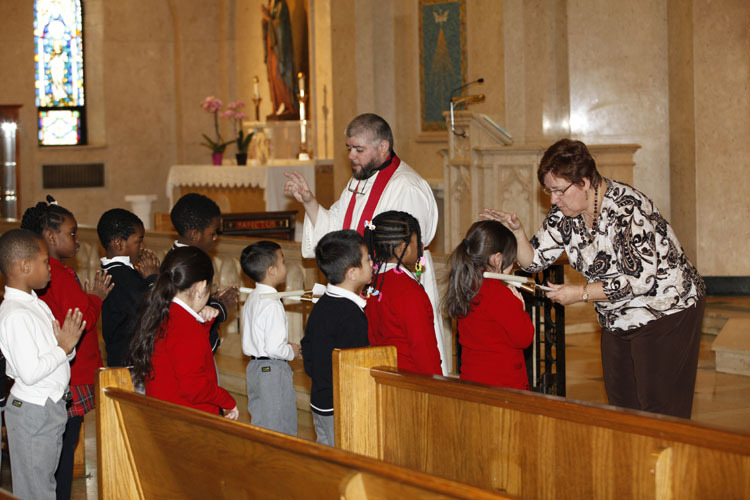 On Feb. 2, the feast of St. Blaise, students received a traditional blessing of throats in the church. 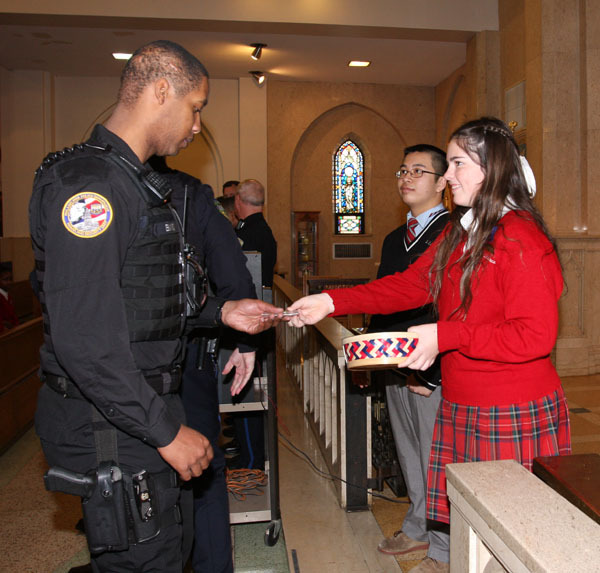 Student Council President Bridgette Carberry (right) and vice president Tanlong Nguyen, both eighth grade students at St. Laurence School, give an officer a medal of St. Michael the Archangel, patron saint of police officers. 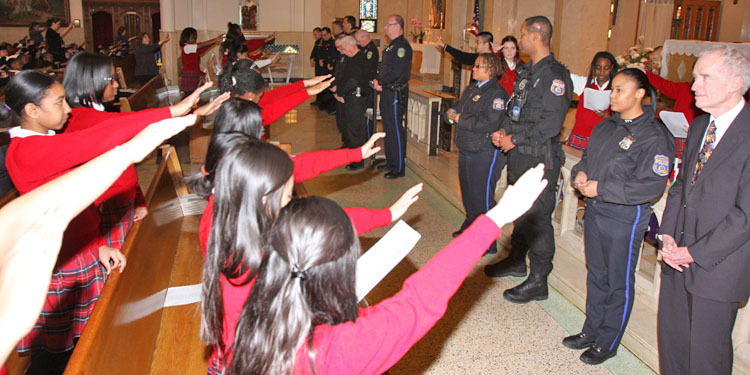 The students raise their hands over the officers in a blessing prayer. 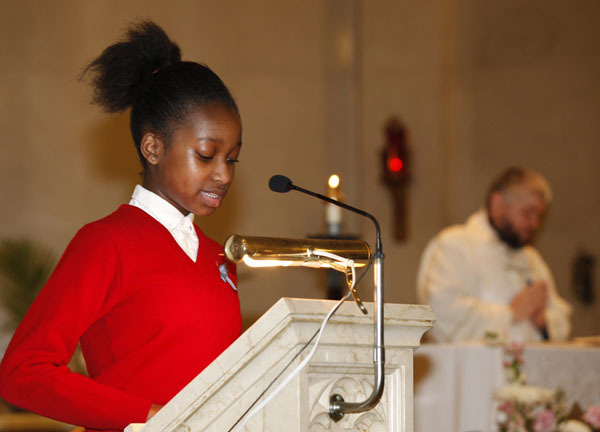 Kymora Howell, seventh grade, proclaims the prayers of intercession during the prayer service. Officers from police jurisdictions in and around Upper Darby pray a prayer together at St. Laurence Church. 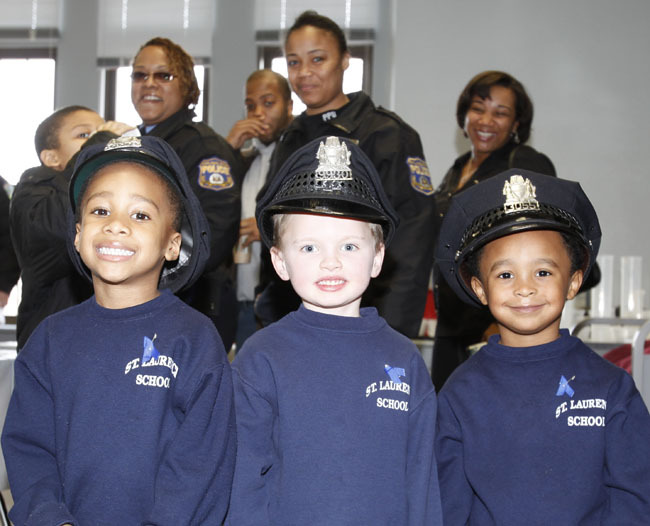 Pre-Kindergartners getting into the spirit of the day are (from left) Christopher Binns, Liam Gabe and Christopher Comrie. Upper Darby Chief of Police Michael Chitwood greets students after the prayer service. 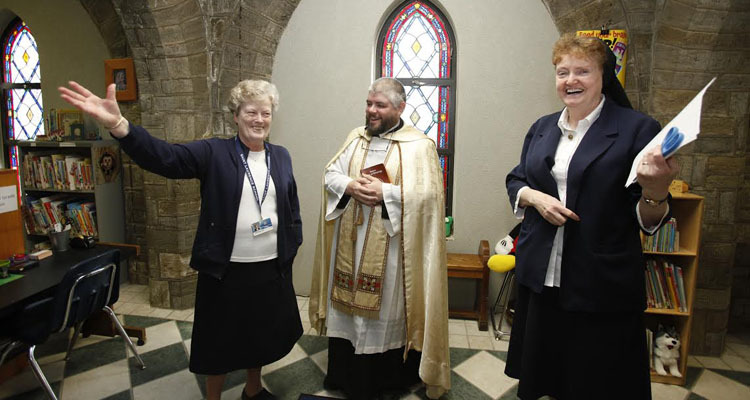 Admiring the newly renovated library at St. Laurence School after its blessing are (from left) Sister Mary Lou Gallagher, I.H.M., school librarian; Father Sean O’Neill, St. Laurence’s pastor; and Sister MaryAnne Bolger, I.H.M., school principal. 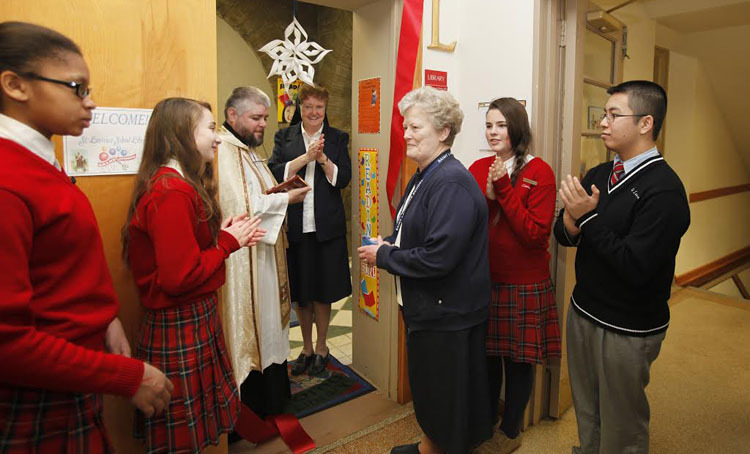 Student council members applaud Sister Mary Lou Gallagher, I.H.M., after she cuts the ribbon on the new library. 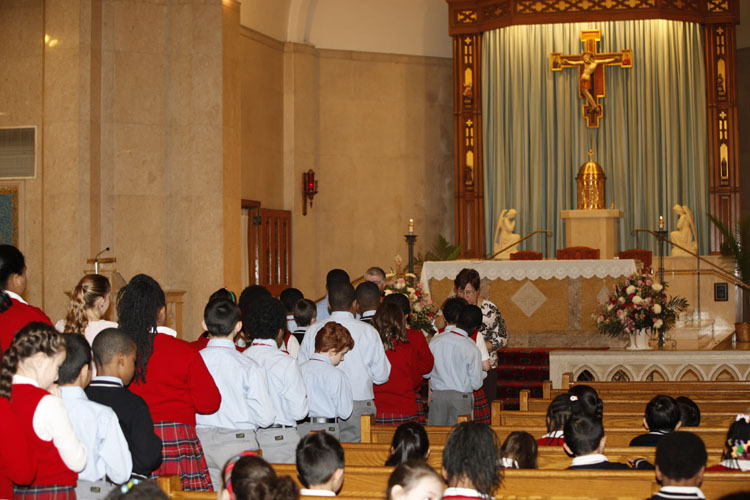 Children of St. Laurence School line up Feb. 2 to receive a blessing for their throats, and a prayer for good health, on the feast of St. Blaise. 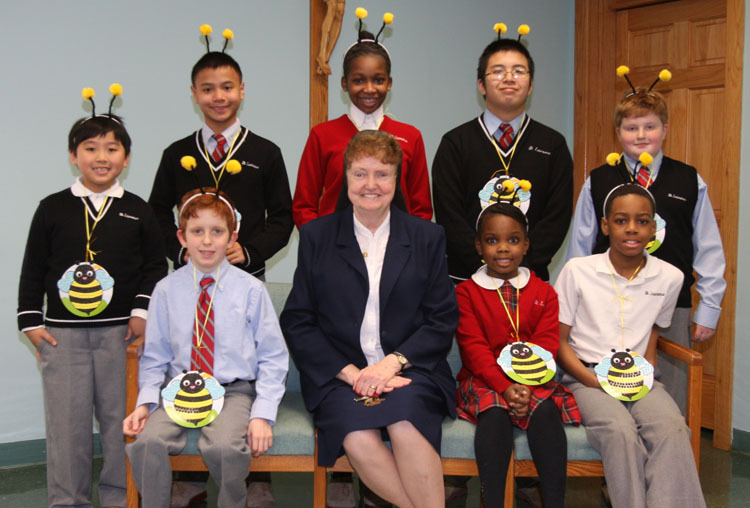 Winners of the “Religion Bee” at St. Laurence pose with their principal, Sister MaryAnne Bolger. Seated, from left, are: Nicholas Kelly, fourth grade; Sister MaryAnne; Yamen Onaegbu, second grade; and Chibueze Orji, third grade. Standing, from left, are: Aiden Gonzales, first grade; Henry Sinchi, sixth grade; Kymora Howell, seventh grade; Tan Long Nguyen, eighth grade and William Papa, fifth grade. I always wondered what happened to Sister Mary Lou, she was my eighth grade teacher. She was one of the best teachers I had in all my years as a student and a big reason why my linguistic skills are as great as they are. Glad to see she is still pursuing her life’s work!